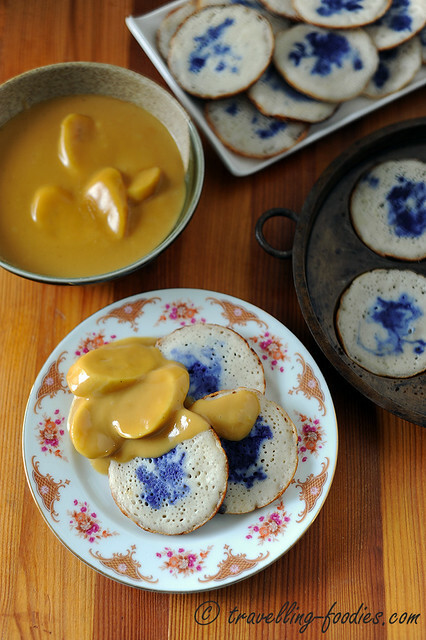 Making Malay and Nyonya kueh is a really colourful game of mix and match. Using a standard list of ingredients, one could come up with a large variety of these sweet delectable snacks and desserts which are so immensely popular and enjoyed by many. For example, gula melaka is commonly used in traditional Malay, Indonesian and Peranakan desserts and its employment into these snacks is literally endless. If it is chopped finely and used as a filling with a dough made with sweet potatoes and glutinous rice flour, it becomes ondeh ondeh as it is known in Singapore and Malaysia or Klepon in Indonesia, but when it is wrapped and steamed in a rice flour batter and banana leaves, it becomes Kueh Bongkong. Another steamed variation with barely reconstituted rice flour which remains grainy gives us Putu Piring. 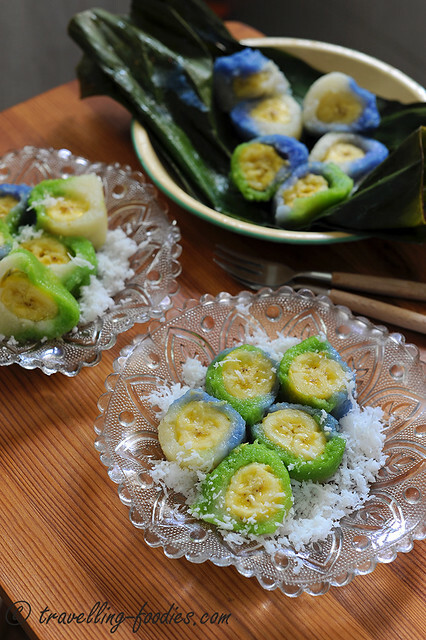 If the gula melaka is cooked with freshly grated coconut, it becomes the filling for Pulut Inti if steamed glutinous rice is used, and Kueh Kochi if it is wrapped into a glutinous rice flour dough over banana leaves. It becomes a variation of ondeh ondeh which some folks call Buah Melaka if the glutinous rice dough is rolled into balls and cooked over boiling water instead of being wrapped and steamed with banana leaves as with Kueh Kochi. 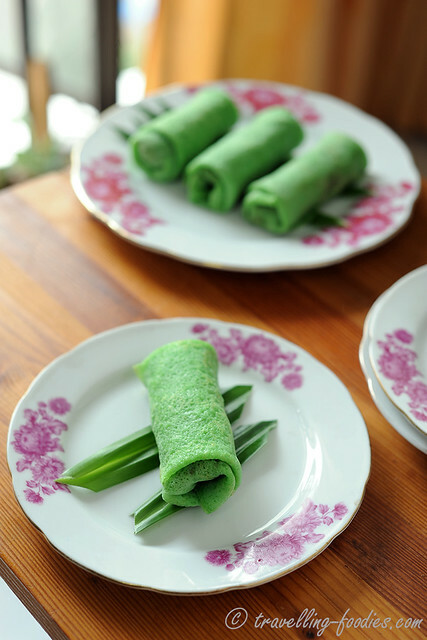 Finally it becomes Kueh Dadar or Kuih Ketayap if the grated coconut and gula melaka filling is wrapped with a thin pancake into a roll instead. All variations of the same theme. This reminds me of the paper dolls which my sister and cousins used to play when we were all young, with “switchable” dresses, hats and whatnots latched over a generic paper mannequin. And this is pretty much the same for Putugal, a lesser known kueh shared between the Peranakan and Eurasian/Kristang heritage in Singapore and Malaysia. 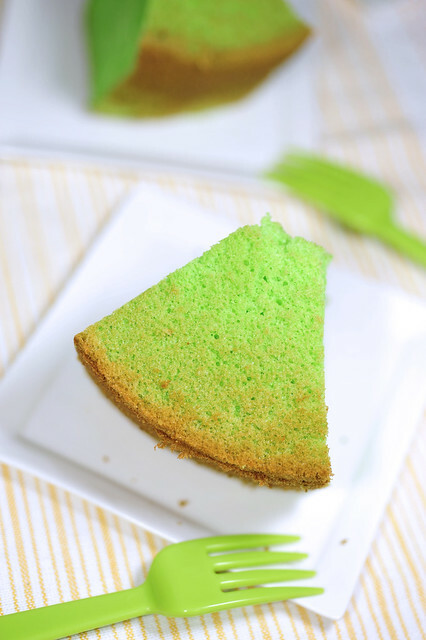 For a lot of us, pandan chiffon is one cake which has a special place in our hearts. It is probably THE cake which we eat the most often when we were young, staples from the old- school neighbourhood confectioneries, which were usually characterised by rotating ceiling fans, and small mozaic tile floors. It existed long before the chicken floss coated mayonaise buns, and would probably continue to exist long after the latter fade off one day. Its popularity seem to run alongside other familiar favorites like egg tarts, napkin butter sponge cake and hae bee hiam soft buns.